The DVD will be released March 21st and features a deleted scene called “Midnight Sun.” Dare we even contemplate what that means? PS Trent from PITNB wants the dvd to include body glitter. But what about a tube top and ticket to see the jobros? I agree with Trent.. i hope it comes with body glitter too. That way I’ll write with it all over my body saying “Do not let Vanessa Hudgens play Leah” yuck. I saw an interview with Catherine Hardwicke a few months ago. She said she shot a scene from Midnight Sun for the DVD extras. Yea! ew is that venessa hudgens thing actually a real rumor?! gross. ive been wondering who will play leah. christapie, if thats true i may die. Are you kidding me??? BabyV (for those of you who aren’t tortured by Disney Channel 24/7 that is what they call Vanessa Hudgens) playing Leah?? Do we need to start another ridiculous Twilight related petition? I will! If they are even considering using a Disney Star I will…I swear I will! I will volunteer to stand outside grocery stores and annoy the hell out people until they feel so harrassed they give into signing that petitition!! 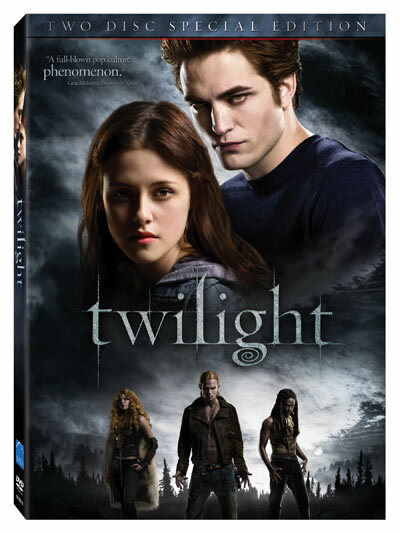 The top of my wish list for the DVD…digital copy so I can put Twilight on my iPod. The I can carry Rob in my pocket all day long. Boss boring during the staff meeting? Watching the kids do gymnastics? Perhaps driving on the Interstate? All great times to watch some Twilight (or at least Rob)! Just wanted to let everyone know that the DVD is available for pre-order from Amazon! Already got my copy reserved! I will avoid the embarrassment of fighting a 13-year-old for a copy at Best Buy, because I would have if I had to. Bring on the body glitter, the wardrobe trailer *Sneak Peaks 😉 and the extended/deleted scenes!! I might be a mom but I fight like a 13 year old girl! Oh god! Nsync concerts! Don’t even get me started! I’m probably one of the poor 13-year-old girls that you gave bruises too! Ha! No, probably not because everyone I got thru didn’t look too hot after facing mean! I was an evil girl when it came to Nsync! And now I’ll most likely be the same way with my copy of Twilight because I haven’t decided if I want to pre-order it or wait in line… waiting in line sounds like much more fun! But, I might be outta town on a school trip… ugh idk! Bible study curriculum! Yeah, everyone wants to watch in horror/wonder at that… Haha. Everything on your list + Borders Edition + Free Twilight Merch (T-Shirt/Jewelry/Etc.) + Rob&Kris’s Cell Phone #s/Screennames + Robert Pattinson & Kristen Stewart Clones (Not everyone can own the origs, but I would have the originals) = I would buy it! “Midnight Sun”? Hmm…I can only imagine. Must have something to do with Edward, I’m sure.